Skin and all! It looks alligatory. Unlike almost every other dinosaur fossil ever found, the Edmontosaurus named Dakota—a duckbilled dinosaur found in southwestern North Dakota in 1999 and announced to the public last December (see story)—is covered by fossilized skin that is hard as iron. It’s among just a few mummified dinosaurs in the world, say the researchers who are slowly freeing it from a 65-million-year-old rock tomb. The fossil is still embedded in blocks of rock. Excavating with toothbrushes takes a long time. This entry was posted on Saturday, March 29th, 2008 at 10:54 PM	and is filed under Ancient. You can follow any responses to this entry through the RSS 2.0 feed. You can skip to the end and leave a response. Pinging is currently not allowed. Hi, I am from the Blogspot network. I wish to advertise my blog, a historian’s blog. You’ll see what I am talking about when you go to it. Thanks for the audience. Bye, guys. Visit my interesting blog. Thank you. Come see “Dakota” at the Heritage Center in Bismarck, ND. While we’re not using toothbrushes to clean the fossil, it still takes a lot of time. Currently the arm and tail are on display while the body-block is being worked on in the lab. The skin is fantastic, so if you’re driving through, make sure to stop by. Oh wow, how exciting! Are you working on Dakota yourself? 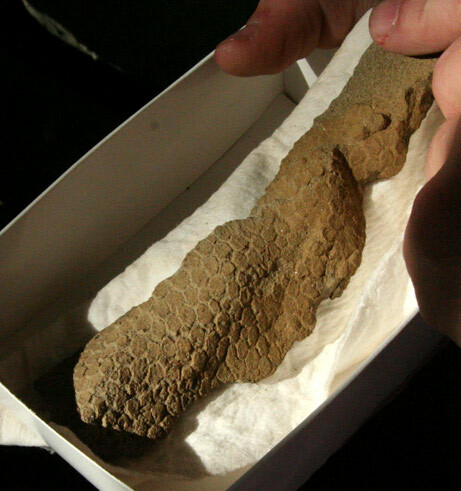 does anyone know how to contact a scientest about dinosour skin? i have many questions about the one my husband found in montana? i want to find out if it is real, or what it is, it looks simular to this. please let me know. Your best bet is to contact the paleontology department of the nearest university to you. Look for a large state uni and Google the phone number for their biology and/or paleontology department.